On Sunday, three students from Penn State came to volunteer as part of the university’s Rebuild-U day of service. 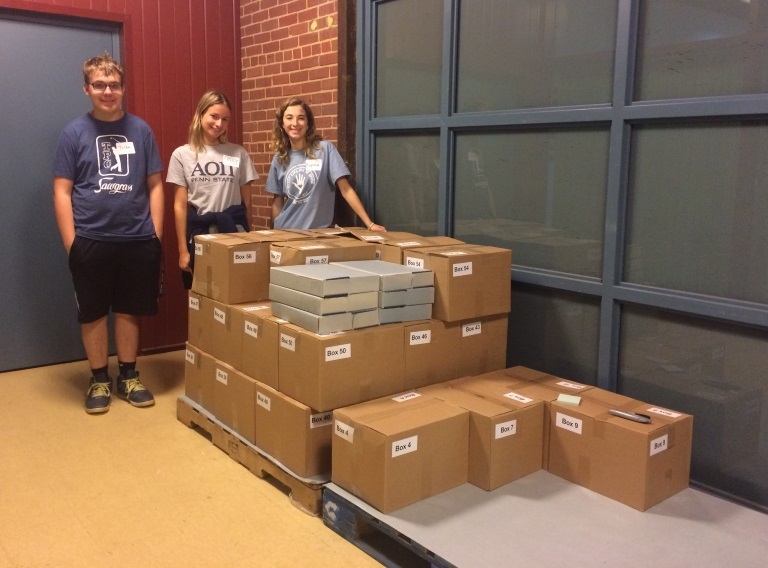 They unpacked a recent donation from Library and Archives Canada — 93 boxes! — and moved it to shelving on the second floor of the library, where it is ready to be processed and added to the collection. The donation contains material being deaccessioned by LAC and not previously included in our collection — perhaps most notably, documents of the Universal Postal Union and other postal treaties. Thank you Brennan, Emily, and Justin for your help! 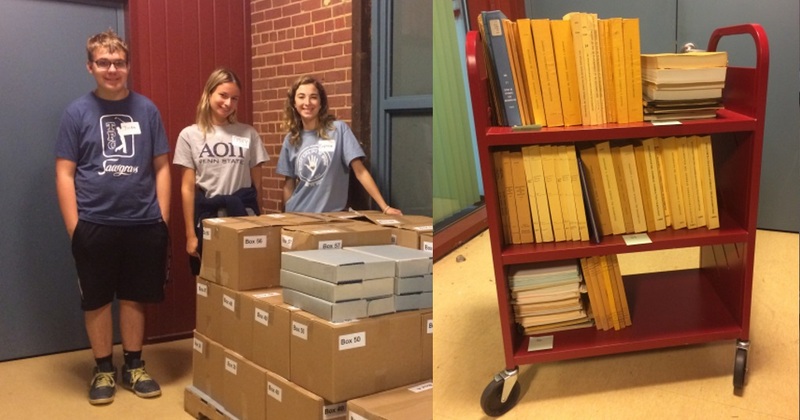 The APRL is fortunate to receive such generous and important contributions to its holdings. It is more fortunate, still, that our wonderful new building can accommodate such large contributions. Considering the magnitude of this archive, can APRL provide an estimate as to how soon the contents can be entered into the Philatelic Union Catalog? Any idea about when a finding guide might be created? The UPU material, in particular, seems very interesting and important. We have just recently made some headway into processing the first part of this donation, received in January. So I would guess it might be a year or two until we can get these into the catalog with our current staffing. Because they are all published, they’ll get their own entries in the catalog, and I don’t think a finding aid will be necessary for this collection. I’ll certainly share more information about what is contained in the donation as we work through it. In the meantime, we do have an inventory of the donation, so if there is something specific you’re interested in, we’re glad to dig it out. Would it be possible to make a scanned copy of the inventory available through the Philatelic Union Catalog or some other vehicle? It is difficult to know what might be of interest without knowing what is available. Those UPU books look interesting for one of the chapters I’m working on. 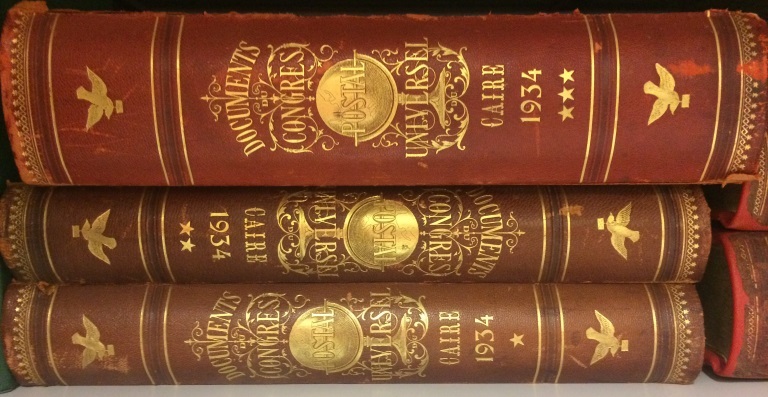 Your comment raised a question: given that these acquisitions will be filed throughout the library, when large donations like these are received, do the PUC entries in any way identify the origin or source? We use internal notes to track donations. When it is useful, we can use these notes to generate lists. I’m not sure how useful it would be in this case, because once the items are cataloged, they can be searched (along with material previously included in the collection) by subject.